Have a memorable Fourth of July? Proclaim pride in the USA year-round with Americana style! This style includes elements like American flags and quilts, of course, but for a more subtle approach, choose classic American furniture of the colonial and farmhouse varieties, folk art, shingles, plantation blinds, ticking stripes, Amish quilts and iconic logos like Coca-Cola. To attain the look, an explosion of red, white and blue or ginghams and plaids everywhere aren’t necessary, though. 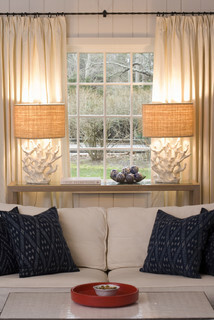 There are plenty of ways to embrace the style, such as in the picture above of a sea-side subtle Americana look. Iconic American logos and products like Coca-Cola are also a part of Americana style. 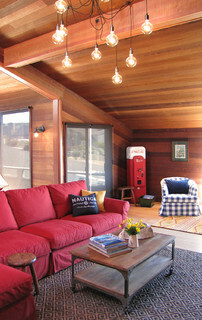 The vintage coke machine in the corner below can serve as a great conversation piece. A shingled porch is a great place to flaunt Americana style. 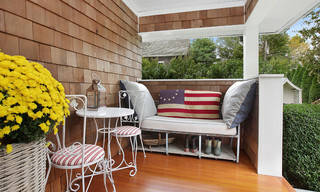 A large pillow in a Betsy Ross-inspired design and striped bistro chairs bring patriotic style in the picture above. 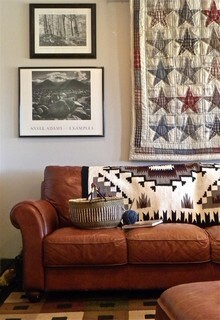 For a completely different Americana palette, iconic photography from Ansel Adams, a star-patterned quilt and a weathered caramel leather sofa complete the look below.